The 3-series has been focused on improving the user experience for our core users of application developers and operators. 3.5 brings usability improvements for both and lays the foundation for further improvements down the road. 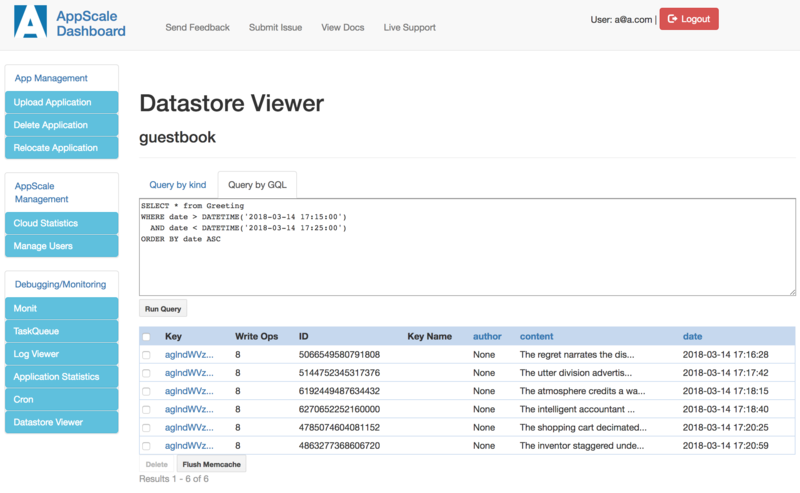 Possibly the most visible change for developers is the addition of the Datastore Viewer in the AppScale Dashboard. The viewer allows the application owner to query data that applications store in the Datastore for debugging and troubleshooting. Keys and entities can be retrieved using GQL, which is a query language similar to SQL. Addition of the '--project' flag to the tools (for now available only for Python applications) simplifies work with multiple deployments and mimics the behavior of 'gcloud' tools. On the operational side, AppScale 3.5 continues the trend of quantitatively exposing the behavior of applications and the system for monitoring, alerting, and troubleshooting. Many new performance indicators are available for internal services. In particular, queue sizes, request rates, error rates, and response times are now available for user applications and internal services such as Datastore and Task Queue. Imported into an analytics platform such as Elastic Stack, these statistics offer invaluable insight into AppScale deployments. Finally, AppScale 3.5 brings improvements across the codebase, such as improving Datastore behavior under load and concurrency, improving load-balancer behavior in high-availability setups, restructuring the deployment state that AppScale keeps in ZooKeeper, and more. There are a number of small but effort-saving improvements like ensuring we restore the desired log level for the App Controller when it is restarted. For the full list of changes please refer to our GitHub pages. Get started building and running a scalable application on the AppScale serverless platform today. Try AppScale 3.5 on the infrastructure of your choice!